The easiest way to get the serialport-bridge software is to download and install a pre-compiled binary for your OS. There are two binary versions of serialport-bridge available for MS Windows - an NSIS installer and a stand alone binary. 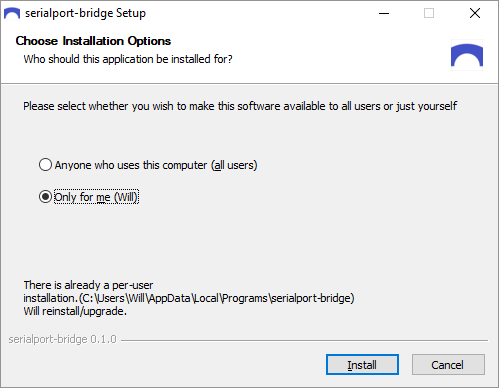 The NSIS installer is a typical windows installation program which will place the serialport-bridge application in your computer's "Programs Menu", add (optional) short cuts on your computer's Desktop, etc. The stand-alone binary version, on the other hand, requires no installation. In this case you download a single .exe file which you simply double click to run the application. After downloading, double click on the installer application to begin the installation process. Depending on your computer's settings, after starting the installer, you may see a screen saying "Publisher could not be verified. Are you sure you want to run this software?" If you wish to continue select the"Run" option to continue with the installation. When the installer is running you should see a screen like the one shown in the image below. Answer the questions and follow the instructions given by the installer to complete the installation process. After downloading, the application will appear similar to the image below. Note, the icon size may vary depending on the .exe extension and may or may not be present depending on your folder settings. To run the application simply double click on the program icon in the folder. 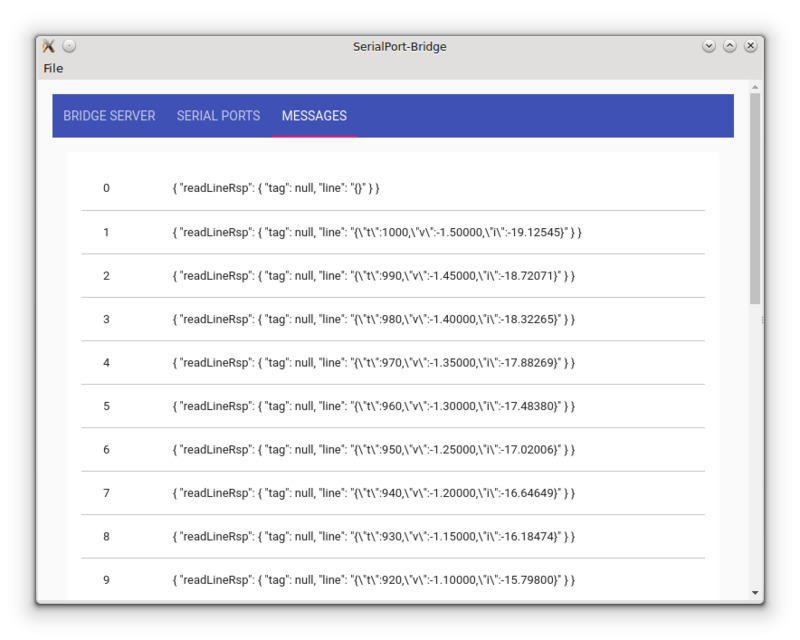 The Bridge Server tab (shown below) provides information about the serialport bridge server. 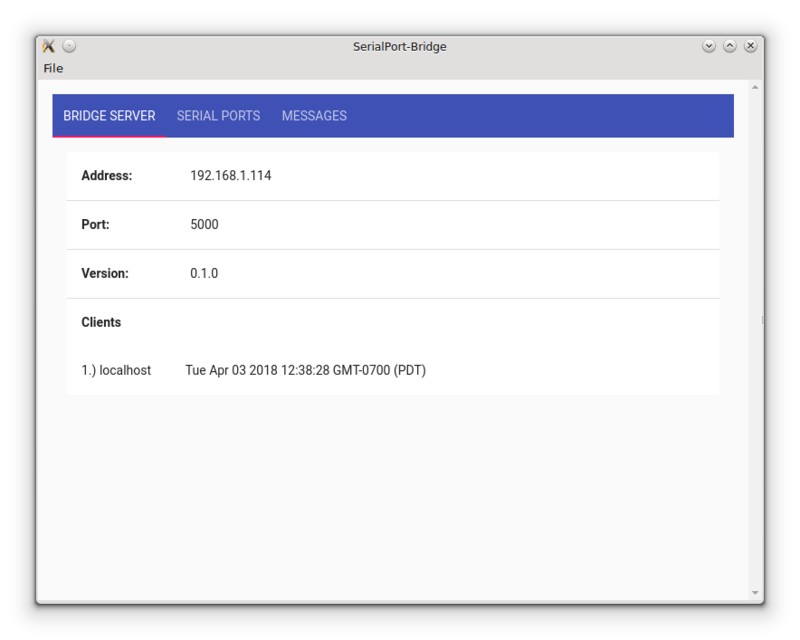 Clients: a list of all the clients connected to the Serialport-bridge server. A client is just an external program which is making use of the Serialport-bridge to access the USB/Serial. This list will always contain at least one client - the Serialport-bridge program itself. 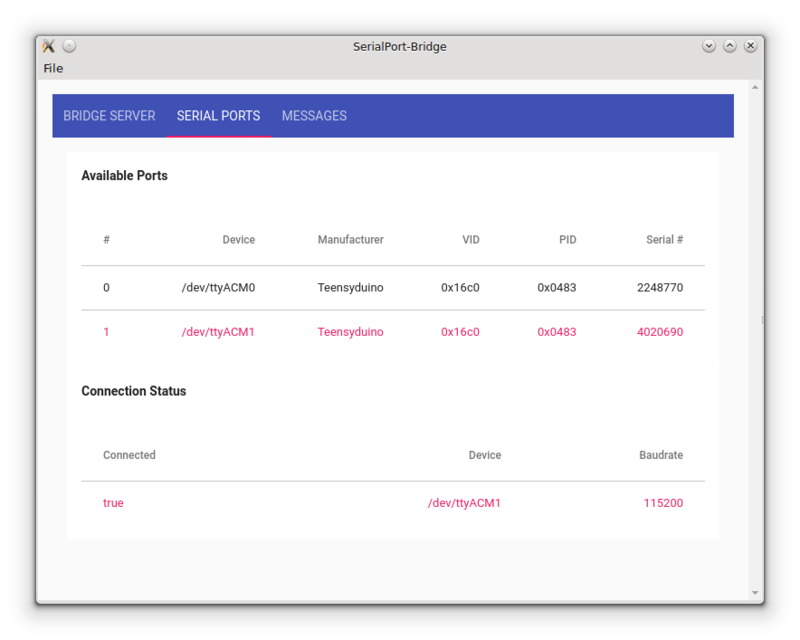 The Serial Ports tab (shown below) provides a list of all the available USB/Serial devices connected to your comupter. This list will update in realtime so that new devices will be added to the list as they are connected to your computer and old devices removed when they are disconnected from your computer. The Messages Tab (shown below)contains a list of the last 25 messages sent and received from the USB/Serial devices.